I would like to invite you to join the Norwex family… a team of people passionate about changing the world, one home at a time. I started as a Norwex Independent Sales Consultant in 2006 and have LOVED every minute. My experience started when my 3 girls were young and I wanted to earn some extra income to help pay the bills. My journey has grown from wanting to earn a some extra money to being a FANTASTIC career. Every day I get to do what I love! I educate people about their options to make the home a safe haven, free from chemicals and in less time than traditional cleaning methods. I get to meet and positively influence people everyday. I have the privilege to train and mentor new consultants. I get to go to parties… lots of parties :). I am a leader of a large successful team – The Solution Team – that has members in both Canada and the U.S.A. I have the freedom to make my own work schedule and enjoy every minute. What would freedom look like for you? Norwex is a well-run, top-notch, direct-sales company that provides eco-friendly, all-natural, effective cleaning and personal products. I invite you to keep reading to find out how to take advantage of this opportunity to sign up as an Norwex Independent Sales Consultant and what is available for new Consultants this month. What a great way to start 2018! As a new Norwex Consultant, you will need products to demonstrate, business supplies and training materials to get you started. Norwex offers a Party Starter Kit to take care of these!!! You might be wondering, what does it cost to start up? When do I start making a commission? How do I get my business started? 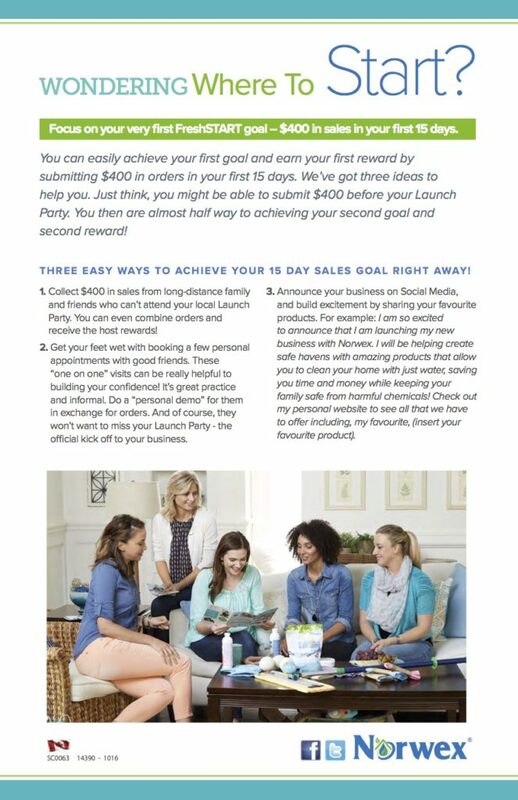 Norwex offers the Party Kit for Free, but you will sign a contract committing to sell $2000 (retail value) in your first 90 days of business. Consider this your first business goal! An average party sells $500 in product… so you will need 4 parties within 3 months… that is totally achievable!!! As a Norwex Independent Sales Consultant, you will start earning 35% commission on your very first sale! You will earn $700 in commission when you sell your first $2000 in product. 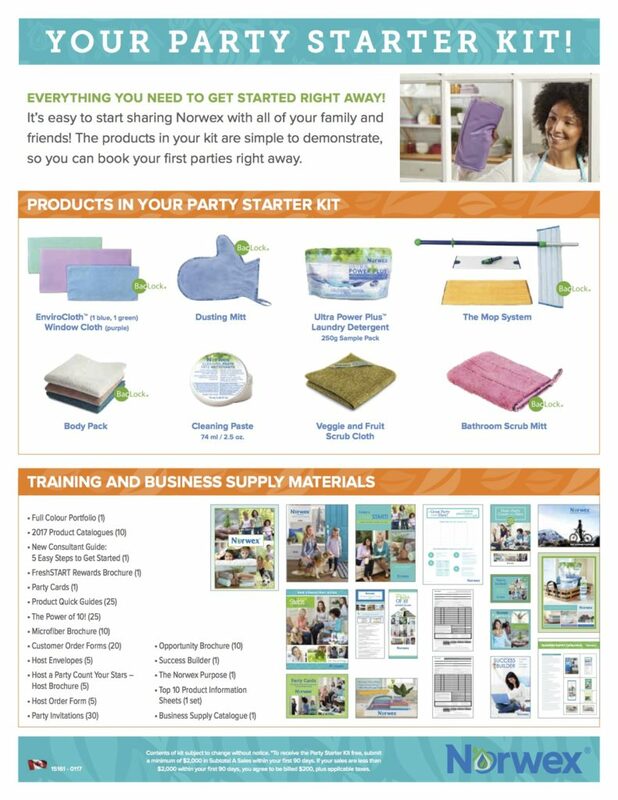 The Party Starter Kit contains top-selling products, like the Mop, EnviroCloths, Cleaning Paste, etc., plus a bunch of business supplies and training materials and is worth more than $300! 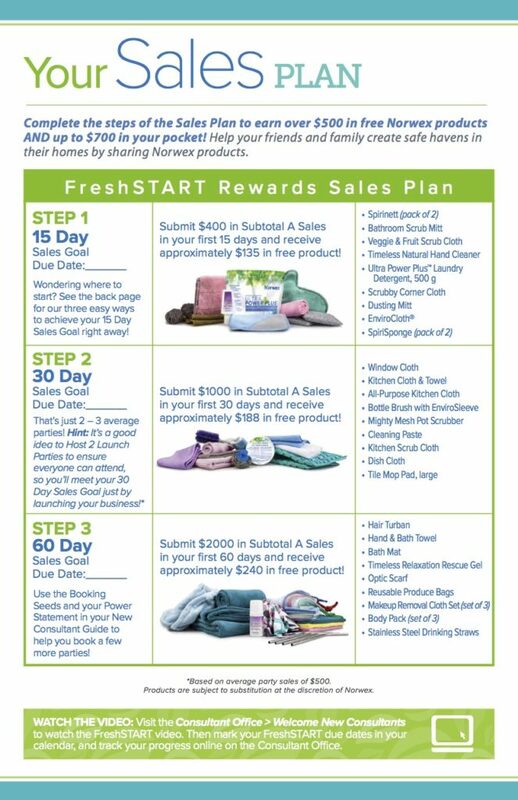 When you sell $2,000 in 60 days, Norwex will reward you with $560 in free product from the FreshStart Program (more info below)! I know, that may sound like a lot… but it is attainable in 4 presentations. Plus, you’ll earn 35% on those sales, putting $700 cash in your pocket. Plan a Launch Party and invite all your friends and family (including those who live far away as Norwex Canada ships anywhere in Canada), make the most of social media like Facebook, host a live party, pass out catalogs, or simply text your Norwex link to all your contacts. With your 35% commission, you need to sell $600 in product to earn $210! Plus, these sales are all you need to receive the first FreshSTART reward (keep reading). Are you thinking? 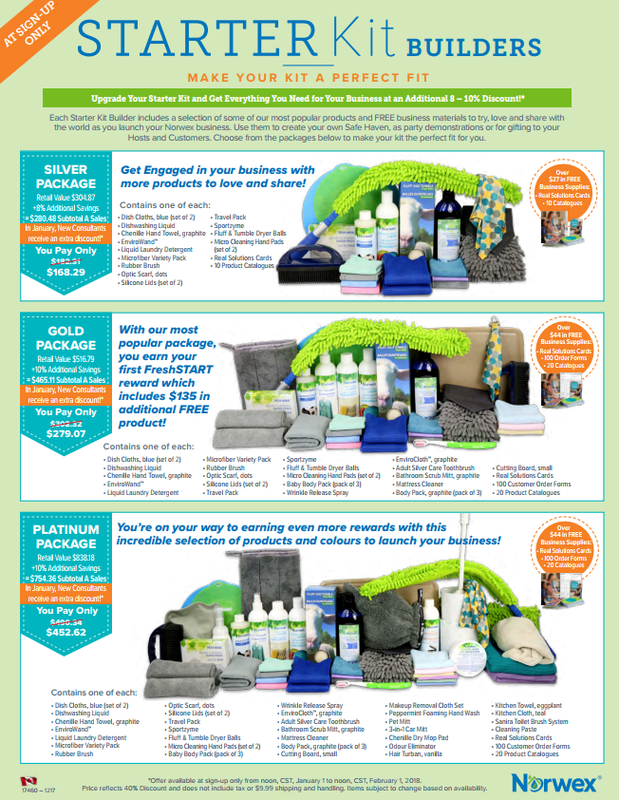 ” Norwex has lots of great product… I need more than the Starter Party Kit!” That’s perfect! 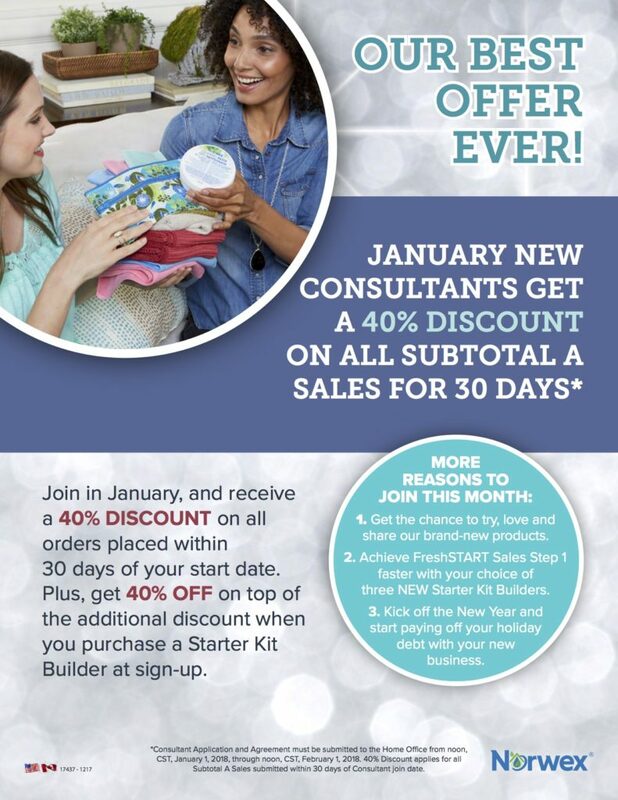 This month Norwex has NEW Starter Kit Builders to get you more product (with the ADDITIONAL 40% for New Consultants this month)! There are 3 options to choose from and they will have you stocked with the best-of-the-best product. Check out the upgrades for more products to demonstrate! Silver Package: Brilliant package to launch your business with success! The free kit is great… but the more product you have, the more you can try and show! Gold Package: My personal favourite package!! The value of this package that keeps on giving!! It’s retail value is over $400, but you’ll only pay $279.07. When you sign up and select this kit… you will immediately qualify for a FREE package of product worth $135 (explained below in the FreshStart Program)!! Plus you’ll have a Kit with all of the number one selling items. Your friends and family will be impressed. Platinum Package: Seriously, you just want it all… right now… at an incredible price. When new consultants add this package at the time of signing up, they will immediately receive the Step One of the FreshStart program (explained below), a bonus FREE package of product worth $135!! Plus, you’ll only be $246 (retail value) away from hitting the next step of free product worth $188!!! Wow!! What is the FreshSTART Program? Now you are stocked with products and ready to go. But where are you going? What is your first step? 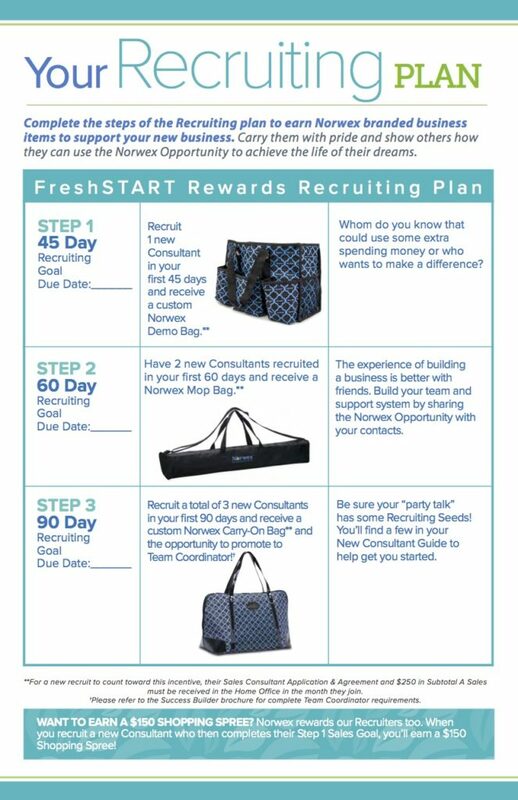 Norwex offers the FreshSTART program to help New Norwex Consultants lay out their first business goals and rewards them for meeting these goals. The FreshSTART program sets out both Sales and Recruiting goals. They are achievable goals that get your business off to a great start. Check out how you can benefit from the FreshSTART program! Thanks for checking out this amazing business opportunity! Norwex is an exciting company to work and be a part of their global mission. “Improving quality of life by radically reducing chemicals in our homes.” Norwex is a business opportunity for yourself, but not by yourself. 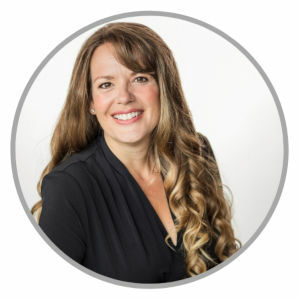 As a new Norwex consultant in my team, you will have access to plenty of training and support, including; webinars, facebook groups, local training nights, team events, one-on-one… you will get what you need. 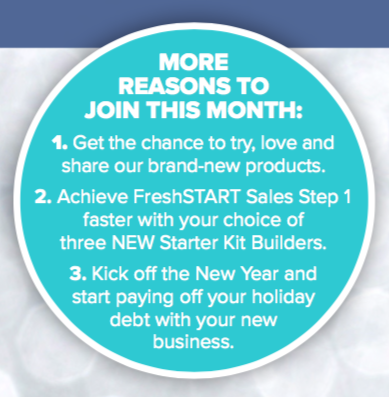 Join my team – The Solution Team – and get your new year and new business started!